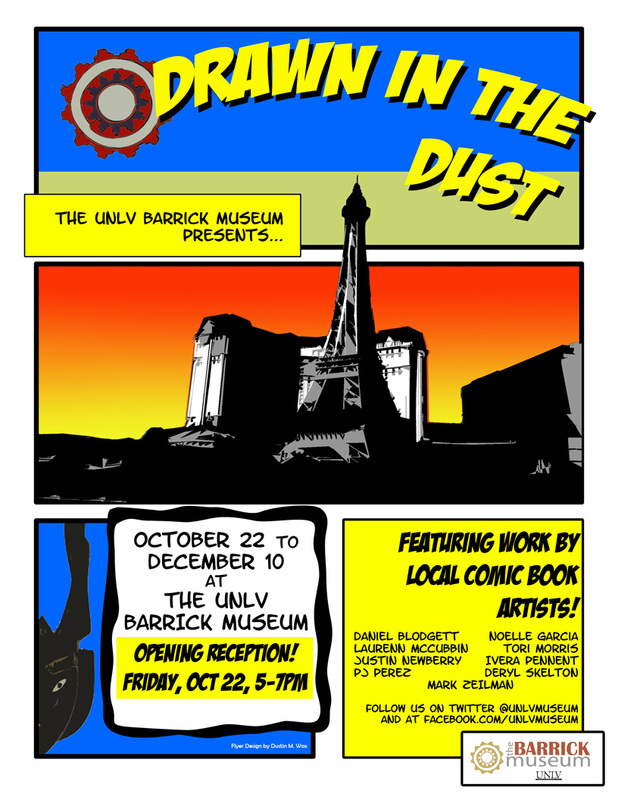 Drawn in the Dust brings together original artwork by Las Vegas comic book artists, exploring both the connections between them and the diversity of styles and expressions among local sequential artists. 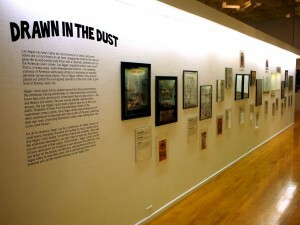 Including work ranging from intensely person…al, self-published comic books to material from national franchises published by comics mega-publishers DC and Marvel, the show is a testimony to the creativity, talent, and skill of a part of our local artistic community that rarely gets noticed. Artists whose work appears in the show include: Daniel Blodgett, Noelle Garcia, Laurenn McCubbin, Tori Morris, Justin Newberry, Ivera Pennent, Pj Perez, Deryl Skelton, and Mark Zeilman. Las Vegas has been called the most American of cities, and comic books are a most American art form, merging the taste for the unusual given life by mid-century pulp fiction with a cinematic aesthetic born on the American silver screen. Las Vegas’ sequential artists make an art that is, in many ways, more American than America — the sweeping vastness of American landscapes acting as a backdrop for intensely personal, human-sized stories. This is Vegas: millions of tiny dramas played out amidst the re-imagined splendors of the world under a giant bowl of blazing, angry sky. Vegas’ comic book artists explore issues from the environmental to the emotional, tracing out the lines of cultural desolation and artistic fervor that cross and re-cross in the desert like so many arroyos — dry and lifeless one minute, the next roaring with life. And like those arroyos, the Las Vegas’ comic book creators have to cut their own paths. Hundreds of miles from the publishing centers of the mainstream comics world, many Vegas artists have embraced a DIY ethos reminiscent of the punk and ‘zine scenes of the past: publishing their own work, promoting themselves online, even starting their own comic book houses. For all its vastness, Vegas can be a small town. Or rather, dozens of small towns, bumping shoulders and jostling for lunch counter space. And Vegas’ comic books, for all their drama and creativity, often read like small-town newspapers: you don’t have to read very long before you see yourself in their pages. 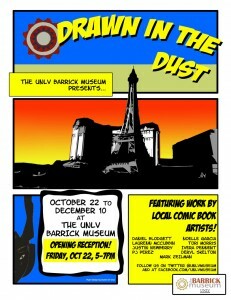 Often literally — Vegas comics are full of faces and places we recognize in part because the artist lives here and draws on the people, architecture, and landmarks of the Las Vegas Valley to draw their story, and in part because their artists’ antennae pick up the invisible essence of our Vegas lives.